Spring 2019 Savings On The Beach at Longboat Key, Florida! Unplug from the work setting to commune with nature and the beauty that surrounds you at the Casa del Mar resort at Longboat Key, Florida. Casa del Mar is located on the turquoise shores of the Gulf of Mexico, in a secluded location at the heart of 14 miles of pristine white sand beach among exclusive resorts. Relax in a 'top-notch' condo (#16F) with vaulted living room and adjacent lanai, views overlooking tropical courtyards & beach, sparkling 25x60 heated (86F) pool, and one of the most comfortable master beds in the state. Only steps from the beach and no road to cross, Casa del Mar’s location is just minutes away from the best restaurants up and down the island & night spots at internationally renowned St. Armand’s Circle shopping district that features al-fresco dining, open jazz concerts and nightly entertainment. Breakfast with all the comforts of home. Surf-fish by morning, dolphin-watch during spectacular sunsets every evening. Local Restaurants: Discover the Lazy Lobster (Center shops 3/4 mi north, excellent food, reasonably priced), or try Seafood Shack (for grouper, amberjack, cobia, or pompano) and Blue Dolphin gourmet omelets), Euphemia Haye - near Center Shops, known for it's vast dessert selection), Marina Jack's (Sarasota-formal, dock & dine, piano bar, or lunch/dinner cruises, BeacHhouse - indoor/outdoor on Bradenton beach, Daquiri Deck -St Armands Circle, O'Learys -Sarasota, Dry Dock Grill, Patti George's, and many others. Cruises/Tours: LeBarge Tropical Cruise (941-366-6116), Nature Safari 'hands-on' Tours Mote Museum (941-388-4200), Sarasota Ghost Tour (941-363-9556), Marina Jack's (941-365-4232), Sarasota Boat Rental (941-951-0550), Enterprise Sailing Charters (941-951-1833), Kathlee D catamaran (941-870-4349), Ringling Museaum of Art (941-359-5700), Paddleboarding (888-548-7731), Sarasota Jungle Gardens -petting zoo (941-355-5305). St. Armands Circle: 2/17 Mardi Gras St. Armands Style 5/6 Classic Corvettes on the Circle; Military Appreciation Day 5/29; 6/10-11 Annual Summer Sidewalk Sale and 15th Annual St Armands Craft Festival; 10/7 (Sat.) Taste of St. Armands (Wine Tasting); 10/14 Wilde on the Water Jaguar Festival; 10/21-10/22 St. Armands Boat Show; 10/31 Fright Night on St. Armands (Sat. ); 11/7 Ferrari's on The Circle; 11/11 Veterans Appreciation Day; 11/11-12 St Armands Annual Fall Sidewalk Sale; 11/11-11/12 27th Annual Fall Art Festival; 12/1 37th Annual Holiday Night; 12/9 Porsches in The Park. Van Wezel Performing Arts Shows: Broadway! 10/3 Neil Berg's 50 Yers of Rock & Roll;; 10/17 Willie Nelson & Family; 11/3 So You Think You Can Dance; 11/18 Three Dog Night; 11/28 Dave Koz 20th Anniversary; 12/2 We Three Kings - An Irish Tenors Christmas; 12/3 LeAnn Rimes Today is Christmas; 12/5 The Buddy Holly Story; 12/10 Too Hot to Handle- Choral Artists of Sarasota; 12/11 98 Degrees at Christmas;; 12/15&16 Ballet Nutchracker Christmas; 12/17 Charlie Brown's Christmas; 12/22 a Christmas Carol; 12/29 Moscow Ballet . Shelling on the beach is great or walk, jog, bike or roller-blade via a paved exercise path that runs the length of Longboat Key (rental bikes avail.) Wave runners available on beach & para-sailing available off site. Volley for serve on our championship tennis courts (rackets/balls provided on site). Casa del Mar creates a comfortable and relaxed environment. Be active, relax, read, and commune with nature & ecology on a secluded white beach. (No stuff to tote- chaisse lounge chairs & umbrellas already set up for you.) Life is good on a beach where you can rejuvenate the spirit, find inspiration... pursue dreams. Unit 16F is a Non-Smoking unit. Owners, Ken and Sue are from New Jersey. Ken is a mechanical engineer, and Sue works in advertising. Ken is also accomplished guitarist, and member of a praise band, and good 'ole fun-time classic rock band in NJ...(always a guitar handy in the Casa unit for his and your use.) Ken says 'People really miss out on the best times of the rental season in April/May and September. The weather is so mild and the water so perfect. Plus the rates are so low. (2 weeks for the price of one in September)!' No impact thus far from the BP spill at all. No no-seeums! We don't believe Casa has ever charged a renter a hurricane day, or a cancellation due to a true family emergency. Rental at Local Tru Value Hardware Store 3/4 mile south on GOM Blvd. This has been my fifth year at Casa del Mar and like a fine wine, it just gets better with age. I could go on and on about the beach and the Gulf of Mexico, but I think I will let the attached picture do the talking for me. So that leaves me to describe the accommodations. This will be my third different condo, and each one is unique within itself. The layout of each condo is a bit different depending on whether you are on the ground floor, second floor, end or middle. My unit had a beautifully vaulted ceiling making the condo seem comfortably spacious. Each unit is uniquely decorated, so it makes for great adventure when you change units each year. I have been going to Sarasota for the past thirty years and never run out of things to see or do. The entire area is incredible, and if you are adventurous Tampa, Clearwater, and St. Petersburg are only an hour away. I always read the previously posted reviews for the year, curious as to what people might complain about since I never can find fault with Casa. It always seems as though the people complaining have something that is broken or in need of repair, but then wait until they check out to bring it to the staff's attention. Most often people don't say anything prior to leaving, which then creates the problem for the next guest. When I went to take my shower, the tub drained very slowly. I told the staff and within ten minutes their maintenance person was there and fixed the problem. While Casa del Mar is as close to perfection as it gets, there will always be minor exceptions, but the difference in Casa and other places I have stayed, is how these exceptions are handled. The resort is heaven on earth and the staff are the angels. Try it, you'll love it. We love the property and have stayed in various condos at Casa del Mar over the past 20 years and continue to return. The condo was well maintained and nicely furnished. We were surprised that more simple things like seasonings etc. were not left in the condo, so it cost quite a bit to stock the kitchen with what we needed, simple things. But overall, not a better location on the island with a lovely beach and pool. Just like the title says ~ Paradise! Enjoyed our stay at Casa del Mar. Grounds are meticulously landscaped. Pool area and beach were clean and had plenty of lounge chairs. Condo was very clean and the kitchen was well-stocked. The carpet needs shampooing though. Enjoyed my morning coffee in the sunroom looking at the gulf. Walked the beach for miles every morning. Not many restaurants or shops within walking distance. Public transportation is easily accessible and there is a free trolley from the public beach. Free wifi in the condo was appreciated. I would definitely return and highly recommend Casa del Mar. We had a wonderful stay at Casa Del Mar. The condo was nicely furnished with everything we needed. The grounds were well maintained and the pool was inviting. The check in and out procedures were very smooth and went quickly. We enjoyed day trips to the Ringling circus and museum and the Mote Aquarium, both being within a short drive. 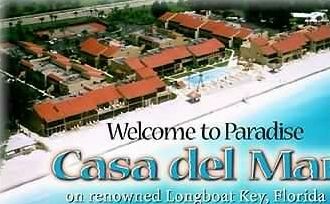 We would definitely come back again and recommend Casa Del Mar to anyone looking for a nice relaxing vacation. We are so happy that you enjoyed your stay. Thank you for selecting us. We hope that you re-book with us soon. Our stay at Casa del Mar was outstanding. The condo is adorable, immaculate and has plenty of space for the whole family to relax (not to mention flatscreen TVs in every room). The beach is gorgeous and the water is crystal clear. This is a great place to come and unplug, but it's also minutes from great shopping and restaurants in St. Armands Circle if you're looking for a night out. If you forget your own beach towels you can buy them in the main office. A great value for the experience! The condo is beautiful, has everything necessary for a comfortable stay. Spacious and perfectly decorated. You can see the water from the sunrooom windows. Quiet property, nice pool, uncrowded beach with powder soft sand and plenty of lounge chairs! The folks at the front desk were very friendly and helpful. We even got an escorted walk to our condo one night when it was raining and dark by the security guard. The grounds are landscaped beautifully with orchids and roses. Try the grouper sandwich at the place next door.